The philosophy of Patient Centered Care guides Sunnybrook staff and physicians to listen to, respect and understand each person as a unique individual. We strive to: Promote timely access to services, coordinate and integrate your care, promote physical comfort, provide emotional support, answer your questions so that you can make informed decisions about your healthcare in partnership with your care provider. Information about your hospital stay, including: Admission, discharge / going home, mail, medical alarm service, parking, patient meals, preparing for surgery, room accommodations, telephones and televisions, privacy and safety, and more. 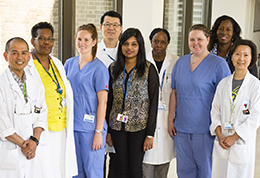 A list of clinical services available at Sunnybrook. Emergency care information, including: what to bring, what to expect, children, labour & deliveries, and discharge instructions. How to get to Sunnybrook Hospital: map, directions, transit information, parking and more. A listing of hospital resources available to patients and visitors, including: Accessibility, spiritual support, access to health records, interpreters, lost & found, office of patient experience, bill payment, telemedicine, and more. 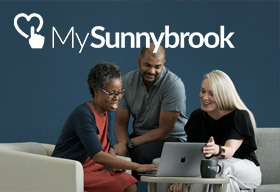 MySunnybrook provides one-stop-shop access to Sunnybrook Hospital services from your desktop or mobile device. Pay a hospital bill, pay for parking, view your health records, and more! Contact patient relations regarding complaints and compliments. Learn more about parking fees at Sunnybrook, including information on discounted parking passes, what parking fees fund and more. Get informed with our various patient education resources, including videos, booklets and blogs. We want to know more about your experiences, and how we can improve to make those experiences better. Information on privacy and confidentiality at Sunnybrook. 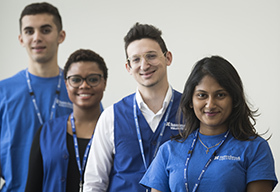 Information on shops and services at Sunnybrook campuses. 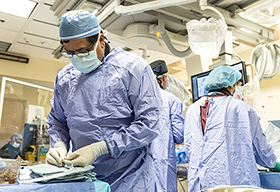 Information on visiting Sunnybrook campuses, including: Directions, patient information, infection prevention, local accommodations, maps, operating room, parking, patient safety, visiting hours, visiting guidelines, and more.